Posh restaurants have long-winded names for their dishes. The expectation is that their patrons are serious foodies who want the nitty-gritty on the food they are about to enjoy. The detailed descriptions just elevate their anticipation and pump up the excitement as they wait to taste what the chef has meticulously prepared. Coco: What did you study @ Dartmouth? Sayat: After going to an Austrian school and subsequently to an American school in Istanbul, I came to Dartmouth to study molecular evolution on a full scholarship. When I was waltzing at the Austrian school, I will never forget my choreographer telling me at the end of the season ”you should probably stick with water polo.” I have a tendency to enjoy everything that I do but I am also quick at recognizing –especially after my waltz teacher felt compelled to tell me before I sensed it myself– when I feel uninspired and unmotivated. In such a state of mind, I switched to Economics and focused on Development Economics (i.e. child labor). I also majored in German and minored in Environmental Science with great passion for agriculture and plant physiology. Coco: How did you end up in the kitchen? Sayat: Right after Dartmouth, I picked up a logistics job, which I loved. For a less known $30BB revenue / year New Hampshire company, I did everything from demand planning and analytics to transportation planning, from writing software to industrial engineering. I gained a lot of hard skills at this company where I stayed for four years. I loved it but I realized my hobby — cooking — was taking over my life. I spoke with a graduate of the Culinary, Quiqui Mussara in Harrisburg, PA, she owned the best restaurant in the area. I loved her food. I told her, I don’t even know how to hold a knife but I’d love to learn in your kitchen, I think you’re the best. She was hesitant about the proposal but ended up taking it to heart. I try to remember every moment in that kitchen, first time walking into it, picking herbs, sharpening my knives, etc. It was a very intense experience. Then it slowly took over my life and I decided to quit my day job after a couple months of 110 hour weeks. Coco: Do you teach at the CIA? Sayat: I do not teach at the CIA though make an attempt at engaging my peers on an educational level, in that I pass on to them whatever I’ve recently picked up or am excited about, which I believe is very conducive to creating a culture of learning and building a strong and motivated community. Coco: What’s the biggest reward of being a chef? Sayat: I think being a cook or chef requires abandon. It is this detachment that focuses you in the moment. It’s meditative. A moment as such can be something as simple as a fleeting smell, an intense flavor explosion, a vision coming to fruition, or getting an approving nod from a chef or a peer. Coco: Do you apply any of your engineering skills in the kitchen? Sayat: The process-oriented thinking really helps with multi-tasking, and putting together an assembly line but it’s not rocket science, if you care you can do it easily. It’s been hard for me to stand back and not take a stronger leadership role as I’m prioritizing hard cooking skills (i.e. techniques, being a line cook, expediting) over management skills, which I have already dabbled in extensively. Coco: What dish do you ask Mom to make for you for your birthday? Sayat: I love yogurt. And this is definitely one of my favorite things to eat. We simply call it ”gul boregi” — it’s a borek rolled into a mollusk-like flower basically. Coco: What defines your cooking style? Sayat: Eastern Mediterranean flavors — I’m dreaming of a convergence of Armenian, Greek, North African, Turkish, Persian and Jewish cooking in Istanbul. Coco: What would you not eat? Sayat: I love food. There is nothing that I will not eat. When I eat I engage with all my senses. I think I want to eat food cooked by good people. That’s what it’s all about. There is always something missing when I cannot engage the dish fully because I don’t feel very strongly about the people. Coco: Are you a sweet-tooth or more into savory flavours? Sayat: I can live without desserts but I choose not to. Coco: What is the most difficult dish you have made and was it worth the effort? Sayat: Biryanis that I cooked in a Mumbai kitchen were probably the most fascinating and most complex things that I’ve ever learned to make. The flavors are so deep, so comforting, so nourishing that it is well worth the effort. We ground our own spices, made all the different gravies (cooking bases in Indian cooking), stewed the meats, toasted the rice, prepared the garnishes only to bring in all the components within a matter of two minutes for pick up. It really exemplifies what I love about Indian cooking or cuisines that use complex, multifaceted preparations to put together a dish that is greater than the sum of its parts. Having said that, watermelon and good feta cheese often hits every flavor note that my palate craves. Sayat reminded me how much I love quince. Native to the Caucasus and Iran, it is the knobby cousin to the apple that has made its way into the Mediterranean. Quince has a grainy texture much like a pear, but a fragrant perfume and flavour all its own. It is often picked before it ripens and holds up beautifully in jams or as a sautéed side dish. Its white flesh magically turns a red peachy colour as it slowly cooks. All too often overlooked, quince deserves more respect on the plate and there is a beautiful cookbook dedicated entirely to this lovely winter fruit. My grandmother Nina used to love making quince preserve and I loved eating it, especially with freshly brewed black tea. 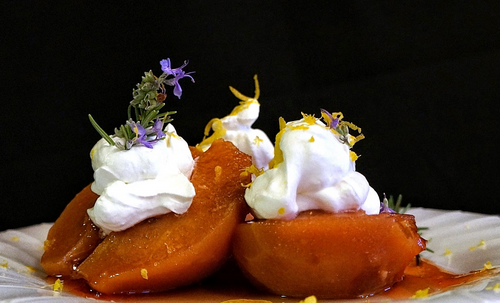 Sayat has a more sophisticated idea with his Cardamom Quince Confit with Rosemary Clotted Cream. Confit is French for chutney, fruit stewed in simple syrup and warm spices. Authentic clotted cream is an overnight process. Here‘s a good explanation. We’re only going to add a sprig of rosemary in there. But, because I cannot wait to taste this sweet concoction, you and I are going cheat and use a faster method. Note: The recipe is mostly in Sayat’s own words so you get a sense of his casual confident approach to food. So, we’re going to peel, halve and core the quince. Keep the seeds and the peels — lots of pectin there, we want as much of it as possible. Soak the fruit with the seeds and peel overnight in simple syrup with one clove, a cardamom, and one star anise. If you don’t have these spices, no big deal. Use a cinnamon stick. The next day, simmer the fruit in the same liquid until cooked through. For a more ”sticky” texture, you can go double simple syrup. Cook it in a pot with a lid, with the fruit half-way submerged in the liquid. As it evaporates feel free to add more water, take out the warming spices if the flavor gets too strong. Turn the fruits as necessary for even cooking. I like doing halves because the core provides a nestling point for the clotted cream. Mix the sour cream with sugar and gently fold into the whipped cream. Immerse 1 sprig of rosemary into the cream, cover with plastic and chill at least 2 hours. Drizzle a teaspoon of the quince syrup over a pretty plate. Place a quince half, cut side up off-center. Scoop a tablespoon of the chilled cream into the center. Grate lemon zest over the top. sprinkle a few flowers over the plate. Awesome interview, and amazing dessert! I wish I could LIVE in a puff of that clotted cream. I love your interviews, Colette! Such fun questions! And this quince compote? HEAVEN! What a great interview, Sayat sounds like an amazing chef and person.